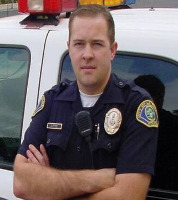 My name is Nick Johnson and I am a Police Officer with the city of La Palma Police Department in Southern California . I have been with La Palma since March 2005. During my time at La Palma , I have been assigned to patrol with collateral assignments on the North County SWAT team, as a field training officer, an explorer advisor, and a K-9 agitator. I attended and graduated from UC Santa Barbara where I met my future wife, Cathy. Cathy is an Oncology ICU nurse at Children’s Hospital of Orange County (CHOC) and we are expecting our first child in mid 2009. February 4, 2006 will be a day I never forget, it was the day I was diagnosed with Acute Promyelocytic Leukemia. The next morning, February 4, 2006 at 0730 hours I received a phone call from the doctor and he told me to get to the hospital and he had a bed waiting for me. At that moment my life changed forever. During the next few weeks, I endured three 96-hour rounds of intense Chemotherapy and was told I was in remission in March of 2005. I returned to work after missing only four months. I credit my wife, my family, my doctor, and my department with my quick recovery because I was never alone and never worried about anything. I am nearly three years cancer free and am enjoying helping others fight the fight I fought.